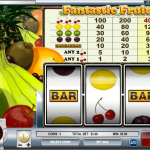 Fantastic Fruit is a 3 reels / 1 payline slot game released in 2010 by Rival. 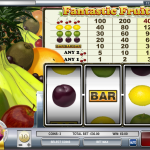 The theme is obviously fruit and this is also the charm or not with 3 reels slot games. The theme is very basic and the games are lacking in bonus features but it compensates with a very fast and engaging game. 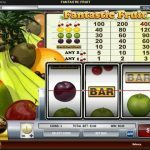 Fantastic fruit is a good classic 3 reel slot game. That’s also its downside because there isn’t anything that really differentiates itself from other 3 reel slots. Well there’s one thing… fruits… Is it enough? We don’t think so. If you’re a fan of Easter then maybe you should consider playing Eggstrava-Ganza a 3 reel slot by Rival.